Ooo as I climbed out of bed my second day on the mountain, EVERY muscle in my body screamed with disapproval, but the Joy and excitement of the day ahead of me drove me forward! First thing, I was able to speak to all the students assembled out side of my hut, all 72 of them! Praise God!!!! As I shared the immense Love that Jesus has for them, they listened so very intently, as you can see on there faces in the pictures. With great Joy I told them that He knew exactly where each one of them lives and every thought they’ve ever had. The fears, the feelings of insignificance and the questionings in their hearts, “does God or anyone care about me”… I tell you, the presence of the Lord was there, touching their hearts and revealing His Love to them. It was so pure and beautiful! It was a chance of a lifetime to see children and youth that had not been tainted by our society’s cynicism. 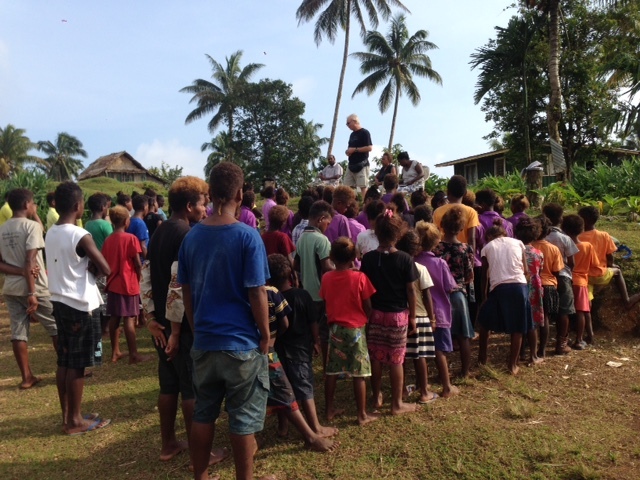 Then many of them prayed with me to ask Jesus to come into their hearts…. After the assembly, Robert took me to each class to meet the children personally. I was stunned with what I saw!! 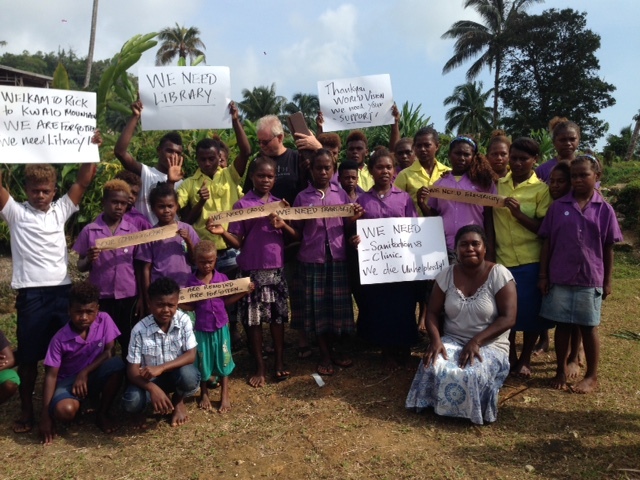 I saw a people hungry to learn and be taught but with an appalling lack of supplies! They are Kwaio People, a forgotten tribe way up in the mountains, far away from civilization! (Out of sight, out of mind)They don’t seem to count to the government or anyone else! No supplies ever make it up to them because they don’t get past the villages at the bottom! The teachers do their best with what they have! 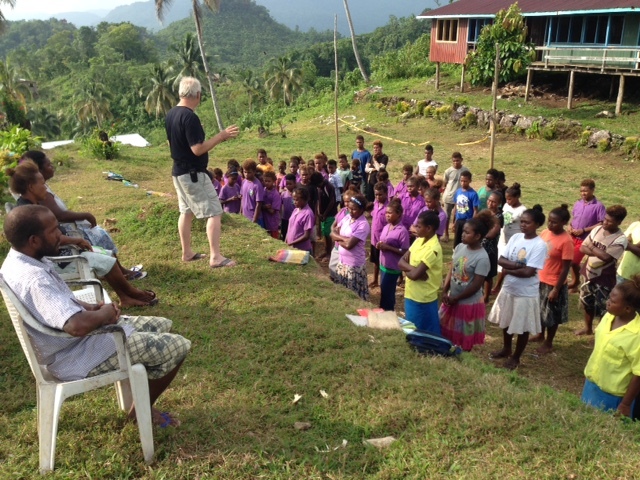 8 kindergarteners assemble under a building…In the 1st to 3rd grade class, 2 grown men are learning to read, (from the “Pagan” tribe, the next village over). They bring clothes, get dressed for school and strip back down when they head back to their village. 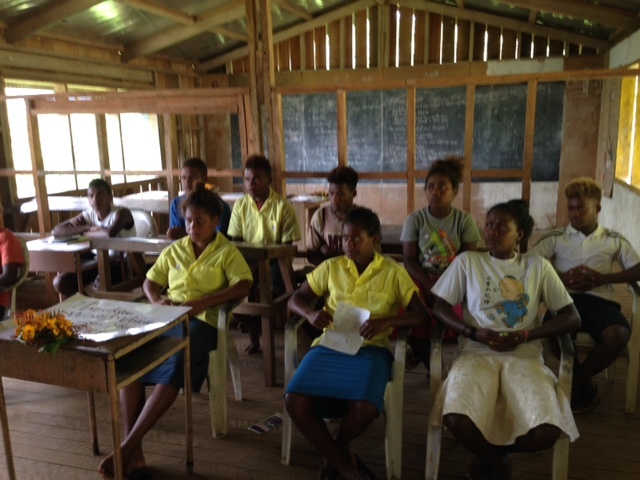 I visited all 8 classes, had prayer with them, including their first six students that are about to sit for their finals and hopefully be the first to graduate from the Kwaio school!! After that experience, I determined by Gods grace, that I would send them books and supplies! World Vision has them in their 15 year development plan, but they are the last on the list. Hopefully after showing them the pictures I took they will try to move them up the list. There is so much more to tell! I look forward to sharing the rest of the story with you all but meanwhile, please keep Robert and the beautiful Kwaoi people in your prayers!! Then, stay tuned for the next post. What happened that night blew me away.